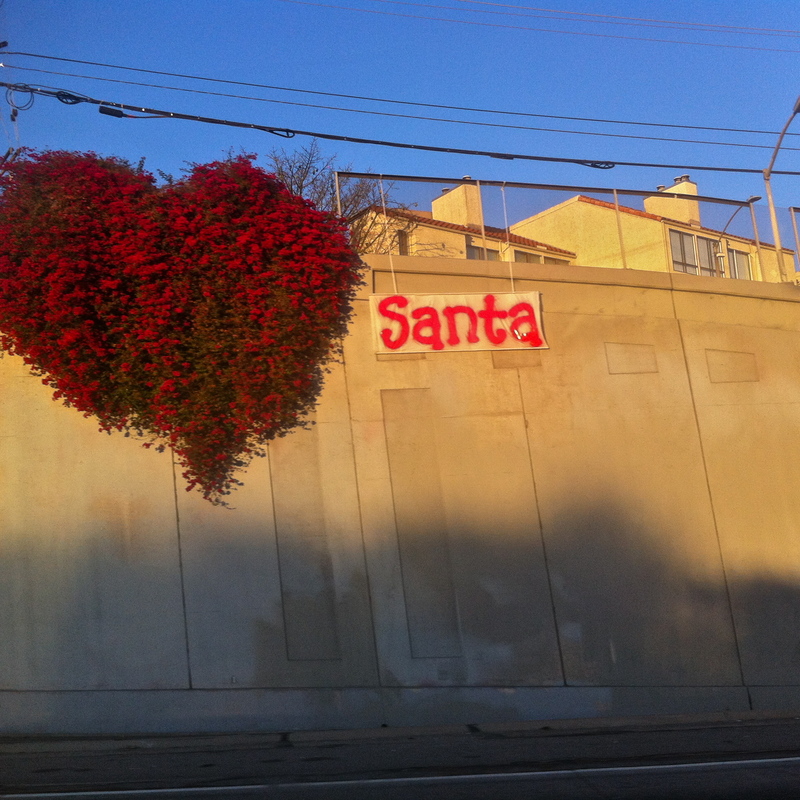 The other day while driving home from downtown Los Angeles after seeing the space shuttle at the California Science Center I noticed a curious piece of Santa’s graffiti alongside the road. A bulging heart of bougainvillea hanging over the industrial beige and grey, oft-chaotic traffic-laden freeway knocked me off my normal reverie for a moment reminding me to find beauty in the ordinary. It also made me realize that I live a bit of a charmed life. No, I don’t have lots of money or prestige or laundry lists of accolades but I have an amazing family, a bevy of quality friends and a boyfriend I love who I enjoy discovering the joys of eating with on a regular basis. In honor of the beginning of a New Year, one in which I am sure to open many more locked pieces of my ever-changing palate, I thought it would be nice to notate the highlights of 2013’s culinary landscapes for my readers in hopes of turning each of you on to a pleasurable piece of the collective pie. Being with best friends and loved ones at the Roosevelt Hotel dining on my 4th favorite Southern California burger from 25 Degrees in the afternoon with cocktails before sending them off to a John Williams concert at the Hollywood Bowl. (And for the record, this is my current favorite burger list: Plan Check, Comme Ca, Stout, the Cute Gardener’s burger made in our own home kitchen, 25 Degrees, Father’s Office). A multi-course dinner at BierBeisl Beverly Hills where I met my all time favorite popover and was gifted an aperitif by the Austrian Chef Bernhard Mairinger who could not believe the CG and I actually ate our entire meal. A decadent French lunch at Bistro Jeanty with its butter colored walls blanketing us as we ate snails, puff pastry soup and pate at noon followed by 48 hours of wine tastings in Napa. Jazz at Café Cordiale in Sherman Oaks with my honey. Discovering a mulita (cheese tortilla with corn rather than flour tortillas) and the thick, homemade masa tortilla courtesy of Don Cucos. Putting another notch onto my “I love Pasadena” list with home-y pasta at Celestino, which also furthered my bucket list item of wanting to be adopted into the Drago family so I can go to holiday meals cooked by all the brothers. Falling head over hills with Elia Aboumrad’s headcheese and other mutilated meats at Gorge, followed in very close second by Brendan Collins from Waterloo and City. Coconut gelato pie at Gusto served by a waitress who was so thrilled that we ordered moscato so that she could open the bottle and sip from it herself. I lick this dessert in my sleep frequently – fluffy, cold, soft, refreshing and sweet oblivion found nowhere else. Pressed cold, marinated shiitakes at Hinoki and the Bird. Pig ears with green verde sauce after ice-skating and a trip to Penzey’s Spices at Hostaria del Piccolo. My birthday dinner at the Kitchen Restaurant in Sacramento for various reasons of which highlights included: walking through blocks of ghetto in high heels to experience, one of the best beef wellingtons I have ever had, the CG getting me extra oysters, a once in a lifetime $200 dinner all just for me, being gifted a bag of green mint homemade pasta by the general manager and all of this taking place on the night before I foraged oranges from the state capitol. Littlefork’s pickled watermelon radishes and marinated mushroom salad. Cocktails and cured meats at PIGG, Chris Cosentino’s now defunct meat market, after leaving the over-hyped Alma still hungry. Finally getting a chance to eat at Patina and loving every minute of the white tablecloth, old school classy, cheese cart for dessert fanciness. Moroccan carrots and apricot affogato at Pizzeria Mozza while celebrating my move in with the CG – apropos since next door at Osteria Mozza is the place we had our very first date. The Stromboli in the bottom of the breadbasket at Scarpetta, not to mention the rest of the food. Trivia night at Tam O’Shanter even though the Welsh rarebit was weird. It was a one time only experience and I live for those – plus we won a round of drinks based on the CG’s knowledge of movie soundtracks. Apple basteeya dessert at Terra in St. Helena. Discovering the odd yet addictive Beard Papa cream puffs in Asian malls all over Southern California. I also learned a few things. For instance, never try BBQ in California – wait until you go to Kansas City or North Carolina. Never think you’re going to find a decent French macaron anywhere but Paris. And the world is a lot bigger than VONS and Ralph’s – my groceries are now most solely procured at either the Chinese or Armenian supermarket. I am ready for 2014 to bring it on and open my taste buds another few degrees on my lifelong journey through fantastic food. This entry was posted in Through The Stomach and tagged 25 Degrees, Armenian Markets Los Angeles, Bar Marmont, Bier Beisl, Bistro Jeanty, Cafe Cordiale, Celestino Drago, Chinese markets Los Angeles, Comme Ca, Cute Gardener, Don Cucos, Father's Office, Food Round Ups 2013, freeway grafitti, Gorge Restaurant, Gusto Restaurant, Hostaria del Piccolo, John WIlliams, Kimberly Nichols, Littlefork, Osteria Mozza, Papa Beard, Patina Restaurant, Plan Check, Roosevelt Hotel, Scarpetta Beverly Hills, Stout Burgers, Tam O Shanter, Terra Restaurant, The Kitchen Restaurant, Unorthodox Foodie, Waterloo and City by unorthodoxfoodie. Bookmark the permalink. Binge Blog reading today and catching up – love all your favorite dining moments of 2013. Can’t wait to read about all your adventures in 2014 and what new tastes you find. Happy New Year!